Somewhere there�s a land full of pirates and Indians and fairies and Lost Boys who never grow old. 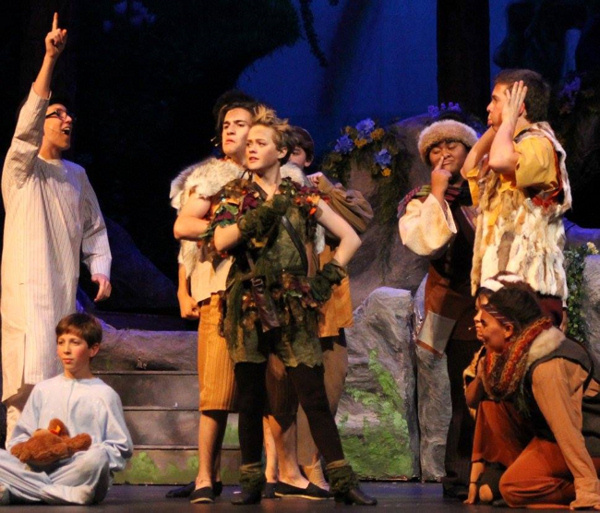 The land is Neverland, an island so small there is hardly any room between one adventure and another. 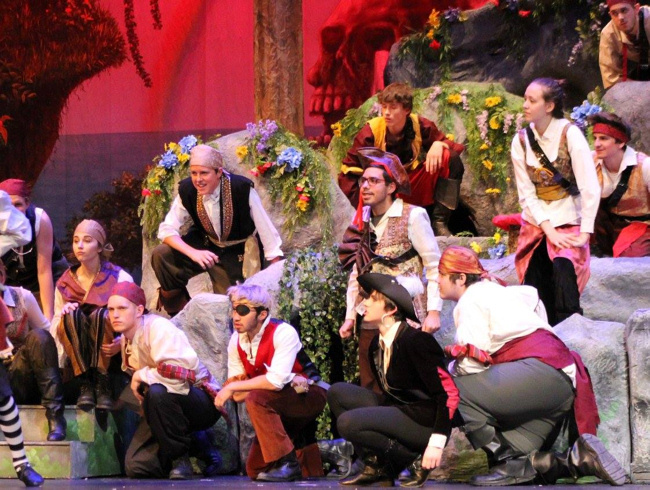 The leader of the Lost Boys is, of course, Peter Pan � the magical boy who flies the Darling children from their home in London to his latest adventures. But in this musical adaptation of J.M. 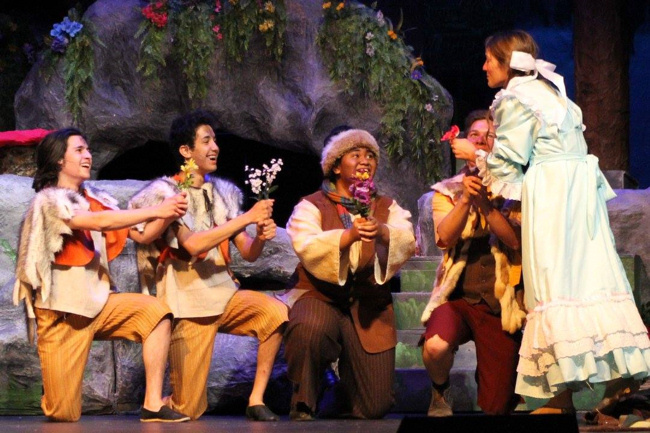 Barrie�s immortal fairy tale, you can only finish the adventure if you�re still young enough to believe in fairies. 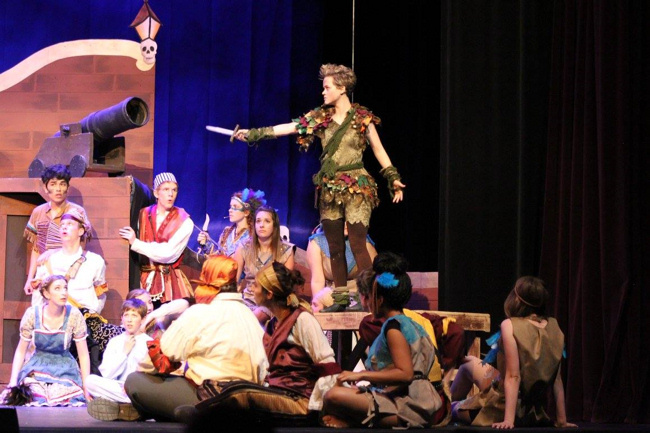 Mesa High School stages this huge production of Peter Pan with impressive sets and costumes, zfx flying, and a big, talented cast, but all while also putting nice touches on the individual relationships and intimate scenes the show features. 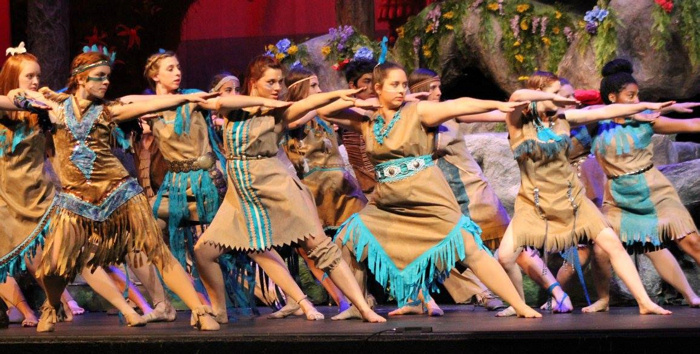 Director Sandy Stones always has some beautiful and innovative touches to include, and Calli Overstreet�s creative choreography adds humor and dazzles. 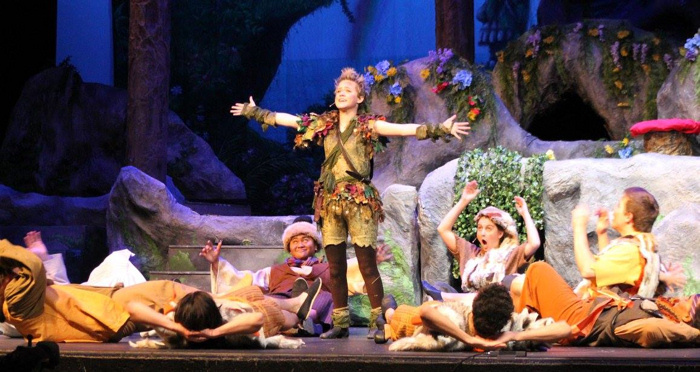 Holly Payne is Peter Pan, a remarkable acting and vocal talent whose boyishness feels natural and who fills the role with soul both fun and deep, ever exuding charisma whether sing of Never Never Land, leading the Lost Boys, struck by a distant memory as he sings his mother�s lullaby, or antagonizing his nemesis Hook either as a Mysterious Lady or as the Pan fighting the pirate for his friends. 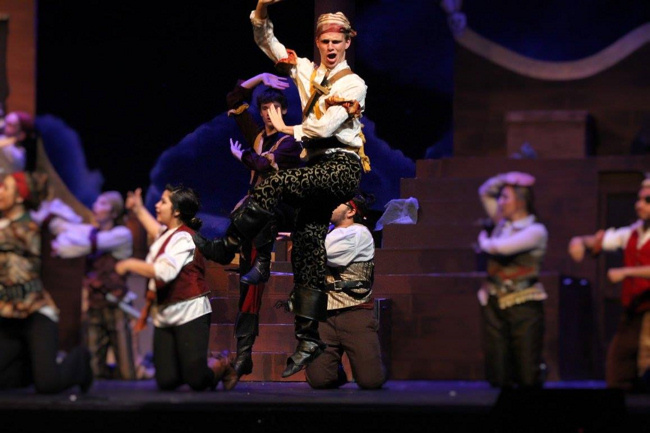 That�s Noah King reigning over his pirates with hilariously villainous swagger, style, and comedic timing while he prepares his team for war with Peter�s Lost Boys, his loyal and amusing Smee (Keaton Harris) ready at his side and the two playing off each other nicely. 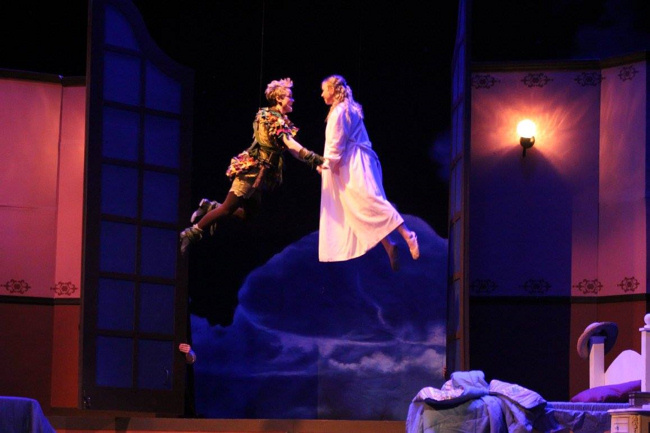 Judy Schnebly shines as Wendy Darling adding lots of personality to the character and a knack for storytelling, with Zakariah Gneiting and David Meek as younger brothers John and Michael charging happily into the air and into their newfound club of Lost Boys. 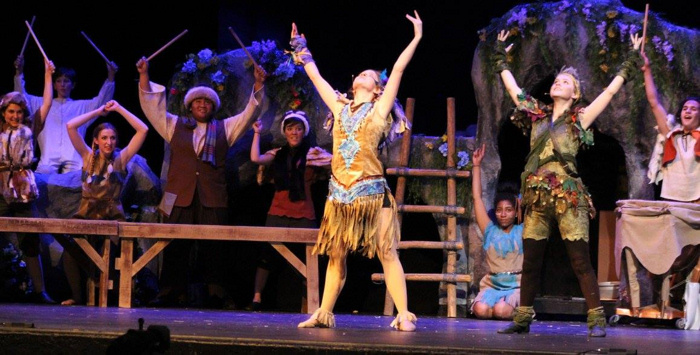 Emily Campbell is lively, fun, and regal as Tiger Lily. Jillen Whitmer is authentically motherly as Mrs. Darling with a mix of tenderness and humor. 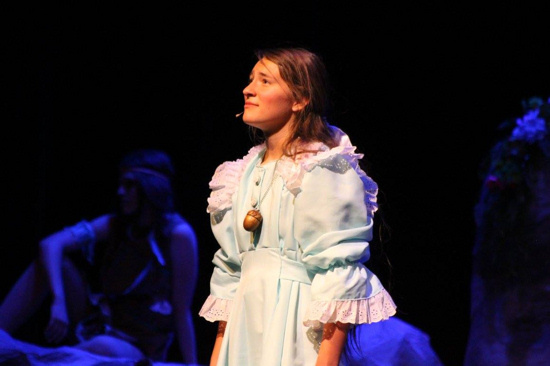 And additional memorable performances come from Miranda Krist as the adventurous servant Liza who quickly adapts to the playfulness of Neverland, Becca Bingham who glows as Jane Darling excited for her first trip with Peter Pan, and Brie Wadsworth giving great character and humor from within the enormous Nana costume. 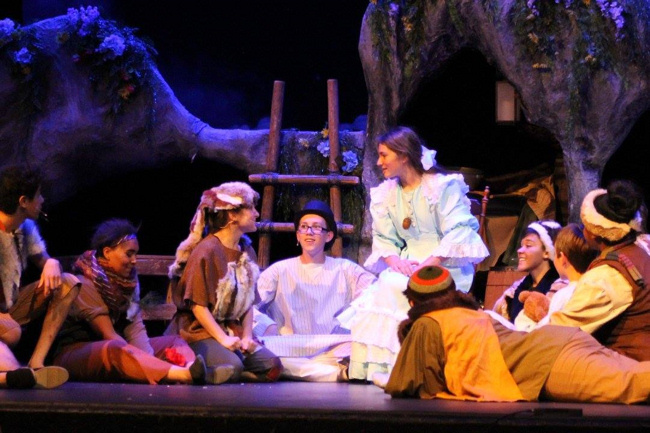 Not to mention the smaller Neverland animals Matthew Meek, Sarah Schnebly, Susan Meek, and Sedona Schnebly used cleverly and adding some extra adorable to the show. And then there are all the group scenes where there�s so much cohesiveness and individuality. 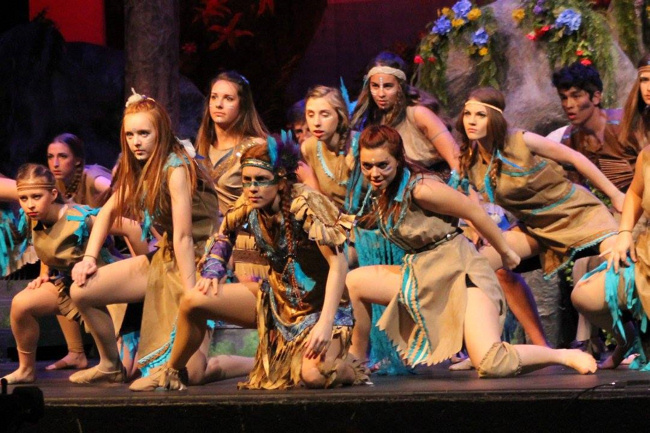 The dynamic and athletic Indians. 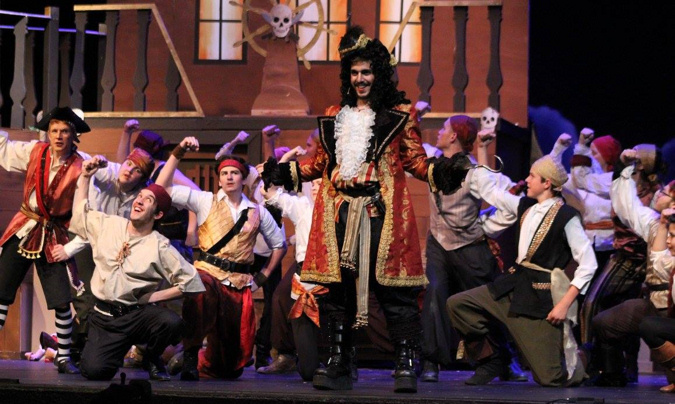 The dastardly pirates with the gift of physical comedy. 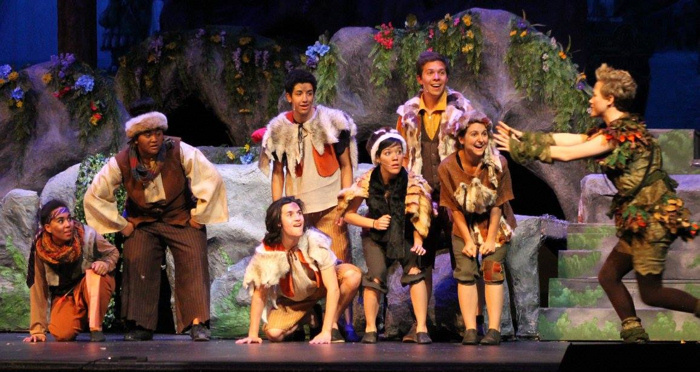 And the team of Lost Boys so excited and proud at their killing of the Wendy Bird, joining with the Indians in the terrific Ugg-a-Wugg dance, a touching goodbye scene with their leader Peter, and excitedly joining with Peter in assuring us that they won�t grow up. 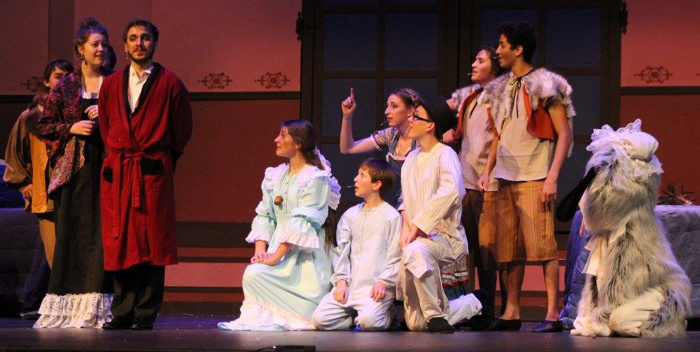 As a whole, the cast and creative team of Mesa High keeps the adventure, comedy, poignancy, and magic very much young and alive.